Over 350 Palestinians have been killed in Israel’s ongoing operation to root out Hamas fighters it says are hiding in Gaza tunnels. Meanwhile, tens of thousands came out to protest the victims of the invasion, almost 80 percent of whom are civilians. 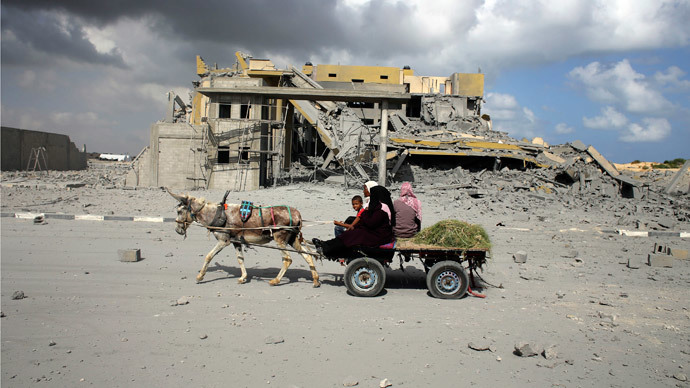 The United Nations mission in Gaza says that more than 60,000 people have been displaced as a result of the escalating conflict. Israel has warned Palestinians living in over half of the country that they may come under fire either from the ground, air or sea. 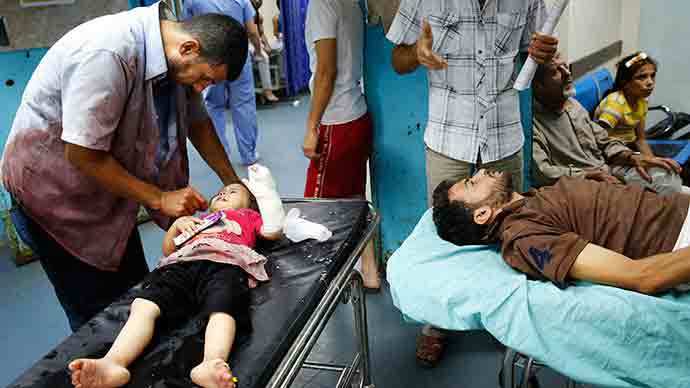 Together with the mounting death toll, the Palestinian health authorities say that over 2,000 people have been injured. Around a quarter of the reported victims have been children. Israeli ground operations, which began on Thursday night, have focused on uncovering a network of underground tunnels – some reportedly as deep as 30 meters – that Hamas had dug near the border, as well as concealed launchpads, from which the Israeli Defense Forces say Hamas militants have launched more than 1,600 rockets since the start of the month. Thirteen of the 34 tunnel shafts reportedly discovered so far go underneath the overland barrier, and into Israeli territory. Several Hamas fighters infiltrated Israel early on Saturday before engaging in a gunfight with IDF soldiers. Two Israelis were shot dead. A Hamas rocket barrage allegedly aimed at the nuclear plant in Dimona instead resulted in the death of a Bedouin man, bringing the Israeli death toll in the conflict to 5 – with three soldiers, and two civilians among the victims. 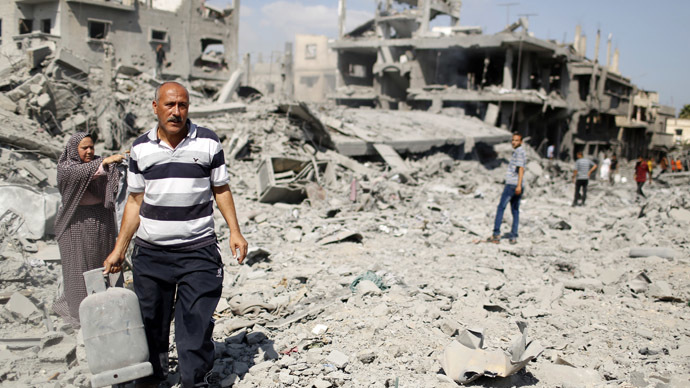 The IDF says that up to 4,000 Hamas rockets have been destroyed so far, about half of the estimated arsenal of the militant wing of the group. IDF officials have previously set the dismantling of Hamas rocket-launching capability as its stated goal for the incursion. Despite an official ban on pro-Palestinian demonstrations in Paris, after last week’s rally turned into an attack on two synagogues, thousands of activists still turned out for an unsanctioned rally. A group of mostly radically-minded Muslim demonstrators built barricades, and set multiple cars on fire as they clashed with riot police, which used tear gas. Other French cities with a sizeable Muslim presence, such as Marseille, also held mass protests. 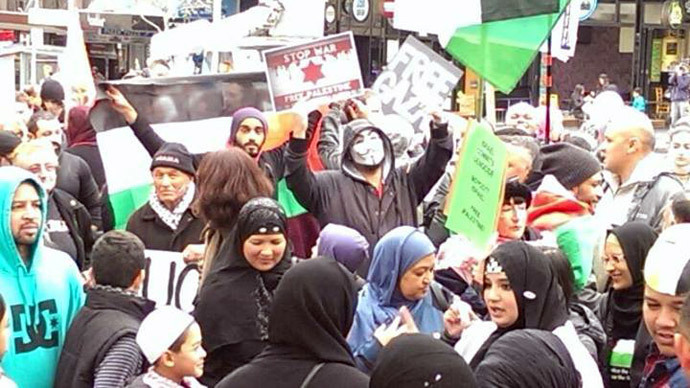 In London up to 100,000 thousands of demonstrators marched up Whitehall as they protested against Israel's military action in Gaza. The epicenter of the rally – organized by Stop the War, Palestine Solidarity Campaign Islamic Forum of Europe –took place outside the gates of 10 Downing Street, the Cabinet and Prime Minister's residence,with many in the crowd holding placards saying“Stop the massacre”and“Free Palestine.”The rally passed peacefully. “The national event today will provide an opportunity for Brits across the country to say enough is enough, the siege of Gaza by Israel and its occupation of Palestinian land must end now,” said the one of the organizers, Sarah Colborne, director of the Palestine Solidarity Campaign. 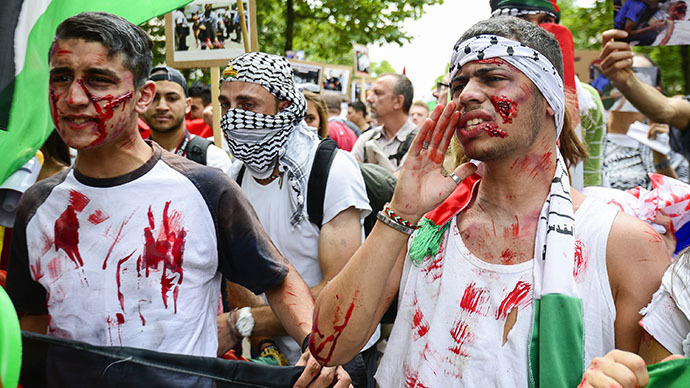 In Belgium, Palestine sympathizers played out dramatic scenes of violence towards civilians. The demonstration in Brussels was not officially allowed but tolerated as long as no trouble was reported. 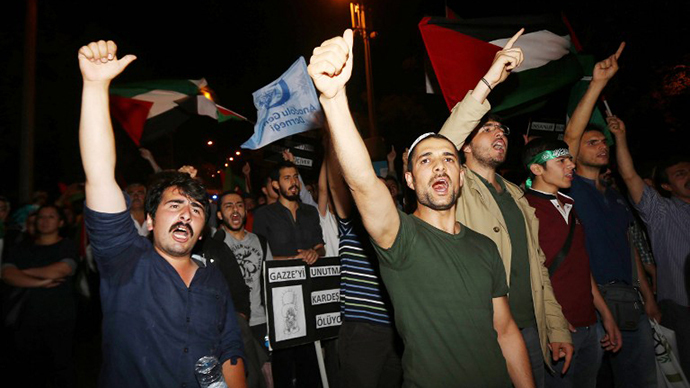 Meanwhile protesters in Turkey burned an Israeli flag, on the same day as Prime Minister Tayyip Erdogan accused Israel of“barbarism worse than Hitler’s”during a public speech.